Specializing in the manufacturing and regrinding of industrial cutting tools for the automotive, heavy equipment, and medical industries. About J. Brisbois Tool Sales and Service. Founded in 1949 by Joseph Brisbois, an experienced machinist and metal-cutting craftsman, the J. Brisbois Tool Company had since gone through three major expansions and is presently housed in a modern, up-to-date facility in Detroit... in the heart of the U.S. metal working industry. 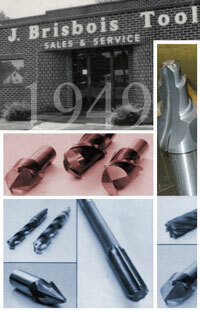 J. Brisbois Tool Sales and Service is currently in the 3rd generation of ownership. J. Brisbois Tool Co. understands that a successful organization is made up of successful people. Our goal is to maintain a team-based working environment which continously provides on-site training, allowing us to provide customers with the tools they need. Discuss your customized tooling needs with a Brisbois machine tool expert today.